I feel I have to answer this comment more publicly, as I feel I was accused of plagiarism in my last post as a lady named Nanette accused me of using her analogy of the ‘Puzzle’ in my last post, The Puzzle of Life the beginning of a series leading up to my post with Barbara in her Awakening Part three.. Links to follow at a later time.. I will let the comment and my reply I gave Puzzle of the Soul speak for itself. Check it out if you already have not done so. In all the years I have had my website Puzzles of the Soul it is the first time I have seen another person use my expression. The title came from my Soul and God it is unique. I would politely say you should use a unique expressions in your work and start by working through your soul and ask God before you begin. Also you used a Jigsaw which is often used within my work and once again this is unique and apart from yourself now, I have not seen it used. I have often seen Life Coaches and “spiritual” workers from the USA copy others work and send it out as their own. I do not normally read your posts but this one was highlighted to me by Jesus Christ. Try to be unique in your thinking and work. All true workers from God and the Divine have their own unique expressions and style. But I do not need to sink to such levels, because I know from which my own source of writing came, and it most certainly wasn’t your blog that I had only visited back upon your original comment the other day. But it really doesn’t matter What You think.. it just shows me how narrow you think GOD is in his abundance of sharing information via our consciousness in that you would think you are unique in this analogy of the puzzle of life..
Do you really believe GOD consciousness is yours alone? It is you I feel sorry for, for you obviously have not found the most essential piece of all… Or you would not accuse me of such a thing.. I will let my readers decide for themselves if my work is my own or not.. Previous The Puzzle of Life ~ Part One. Next Love may be Invisible ..But its Strength is Invincible. Hi Sue. I liked your light-hearted reply. The idea of a puzzle as a metaphor is very old indeed. Thank you Holly, yes its upsetting but I see it for what it is, A narrow view of their own little world of insecurity and as Joseph said their inflated ego.. It will not put me off from being myself.. Or from what I am ‘inspired’ to write..
It’s almost funny how some people think they have a copyright on common phrases they may use that go back forever. Lol. Indeed Holly… This is what is wrong with the world today… Self Importance and thinking theirs is the only ‘Way’. Love is the way..
Maybe this may be just the piece that has been lacking in her life.. I wish her well upon her journey, and she really needs all our love, for she cannot see the fault of her thinking..
Like I said Nanette on her part is inflated ego for sure..
And I and you Joseph will keep on cultivating our creative minds within this realm of existence.. I know of many inventors whose ideas also came at the same time who also accused each other.. When people begin to understand Energy and creation the way we do Joseph, then they may then begin to understand the Bigger Picture of the Cosmos and how it works.. I believe you dealt with her fairly and with grace. None of us own God’s inspiration, nor the many others blessings of this world. Agreed Sue. May you and The Puzzle of Soul remember peace and unity. You don’t deserve such comments at all. I suppose, this soul are feeling very bad about themselves and therefore try to track others down with them and in this case you. Your blog is unique and I do know, that you never would take the honor of others work. Please ignore this soul, dear friend. I can not deny the initial stab of hurt, that anyone would think such a thing.. But then we are living in the time when energies are in ‘conflict’ mode and people are so puffed up in their own ego agenda’s they want to feel Important.. Often by belittling others… When all they do is create an energetic flow which travels right back to themselves..
Bless your heart Irene… ❤ thank you so much..
Gosh, that lady is a bit impertinent to say it kindly. She truly claims that expression and analogy for herself… I have no words… Such a behavior is not much filled with love but rather ego-driven. When more people feel the same analogy then only because it may be a truth and therefore a way to reach other’s hearts in order to make them aware. And what a blessing when that happens. In the end, there is only one truth anyway. So who is entitled to claim that truth for themselves? That is actually what we all have to learn: We are here to support each other and to unite. Such attitudes are going the other way. I love the analogy. 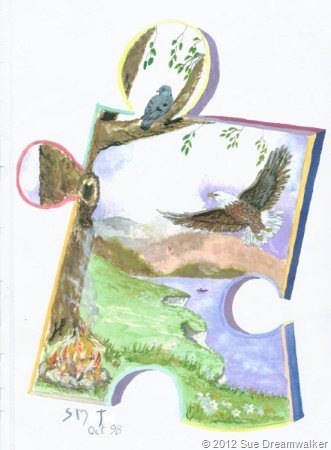 I used the puzzle comparison too in my book and some of my posts when even in a different way. This is used by so many because it pictures and explains a lot. I know such a conversation can throw you off track but as we always say, how people act and react says more about them than about you. Your answers are light-filled and that is all mat matters. Try to let it go. Yes I have let it go Erika, but it I did let it wound when I first read these words, Then on my second reading of her comment, I just felt so sorry for her, as she obviously has so much more to learn about Love and Unity in this world.. Many thanks Erika for your wonderful comment, indeed we are here to learn and unite… Such ego driven vibes are what is so wrong with the world today..
Again thank you kindly Erika… I perhaps should have just shrugged off this comment, but then I felt driven to reply more publicly , maybe this was a needed learning piece this lady needed returning to her… As she learns that we are all responsible for our actions and words.. I hear you well, Sue. When I read her comment and replies I got really angry and I would have been hurt too. But at the same time I thought the same like you that she has some more lessons to learn. I think this was a test for both of you. As you said, a learning piece for her and you could prove to yourself how much you are detateched from such vibes and only focus on the higher good for everyone. That again, is the lesson you gave us to think about. ‘Christianity’ takes on a lot of different shapes, Sue! And so does other religions! Everyone seems to claim an ownership to the absolute truth even if the religion and the words they speak are based on old stories and undocumented ‘Hear-say’. getting more concious to what’s going on in these circles. Many thanks dear Svein, as I just replied to Irene when I spoke on Truth.. Truth will always find a way, and those who believe theirs is the only truth has still much more yet to learn. Bless you Cher… that means a lot to me… and yes, I send you love, and your Dad still gets a thought in the mornings too.. Love and Hugs dear one.. take care and enjoy your weekend.. Thank you Pat… indeed my own eyes rolled too… 🙂 I feel sorry for such misguided souls..who think they are specially chosen.. WE are all chosen to be here at this time, and learn by growing and expanding our consciousness through Love and Harmony, and that will not happen by clinging onto ego and self importance. That’s what friends are for, Sue! And what I’ve written describes who you really are. Good on you Sue. I wrote a poem on the Jigsaw of my Life in 2014 so before this lady’s started her blog, (and I have completed jigsaw puzzles for years). Thank you. Keep doing what you’re doing. Why oh why do we have to continually deal with these expressions? I liked your answer and am “puzzled” that she found this metaphor unique. I know I have used puzzle often in terms of the journey and have had many others speak to me using puzzle pieces as clues to awakening, etc. I am reminded Linda yet again about what Gregg Braden said in his video I posted a while back, I know I am repeating this here again to you, 🙂 but we are in a cycle of change right now.. And these cycles come around at regular intervals, History shows this, that at certain energetic convergences in our planetary systems. We undergo upheavals.. He said we are not only experiencing Climate Change.. But there is also an Economic Change, and the other is that of a time of Conflict.. He said though that this is also a great time in o3.. overcoming conflict and embracing peace..
May we all learn from our past that conflict on what ever level is not needed..
Like Erika said its a lesson for us both.. I could easily have ranted on more vigorously, But I stepped away, ate dinner, and re read her comment.. And thought, I feel sorry for people who think like that.. and there are many I know… I think maybe she thought I was from the USA.. 🙂 I have no idea of her nationality, nor do I wish to.. But its such prejudices we need to step away from, and learn we are all equal in GODs eyes, for we all hold the Divine Spark of the Father, the Source of ALL of Creation.. Including Inspired speech.. ❤ Love and Hugs Linda..
My goodness! The puzzle as an analogy is very old and very common, as is multiple people having similar inspiration. This happens especially with scientific discoveries, but also with bestsellers, etc. It’s how trends happen. Malcolm Gladwell’s classic “The Tipping Point” describes this process from different angles. If she wants to trademark “Puzzle of the Soul,” then she would have some kind of legal grounds in whichever country she would go that legal route in, but usually titles cannot be copyrighted. Also, in order to trademark something it needs to have something that sets it apart from the public domain. The energies are very intense right now. It’s interesting how different people choose to experience them. Blessings and love, Sue! You hit the nail on the head, Dear Sue. “We all of us tap into the Collective…” Consciousness we can pull all words and thoughts to us. Nothing is exclusive. Nothing! It is all one as we are. It does make the day a bit sour to have someone so far removed from truth start hurling baseless accusations. Those of us who have read your blog for any length of time know you would never even think to plagiarize. You are correct, it is ego driven. So sorry for her. Love and hugs to you and let this go as her problem. Exactly Marlene.. I went back over to her site and and found a page about her, a video, I think maybe she is a little misguided and very insecure and I felt doubly sorry for her after listening to her video.. And now I feel I should have not posted this reply publicly.. But at the time my heckles were up.. And what she said was total rubbish.. Now I am wading through comments, that I feel are only perpetuating that energy, but I will clear the air on here with a short uplifting post about Light later this morning with comments closed, as my follow up is scheduled part two of the puzzle tomorrow. .. 🙂 🙂 Much love..
Hi Sue… Just a quick response as I have not read all the comments here. You write lovely words always. Accusations of plagiarism are unjust. How many times have people come up with ideas at similar moments? Well history is littered with famous inventorsa, but not the identical inventors who didn’t get any credit for their simultaneous work. Bitterness destroys. Thank goodness it is not you who is the one feeling it. Many thanks Colette… I know its ongoing all the time as we tap into the collective consciousness, and I feel a little ashamed at my public response to this lady, but I felt at the time I was not going to let this pass. Many thanks for your hugs.. ❤ Hugs back.. This post cropped up in my reader earlier, so I must have been guided to read it at that time as I don’t spend a great deal of time in Blogland at the moment.Dare I say it has inspired me to write one of my nonsense tales? I dare – and will post it tomorrow. It has nothing to do with this woman, however, just ‘inspired’ by her thoughts. She’ll probably think it is about her, though, and really take the ‘ump. I know you speak your words, Sue, always enlightening, encouraging and thought-provoking. It is the way of the world at present, however, and more and more people are becoming more selfish about a lot of things (I do include myself here as well, we are all learning every day, I hasten to add!) and therefore tend to think that their ‘vision’ is ‘the’ vision. We all need time away to look at and think of things, but then the danger is over-thinking and ending up in a right tizz! Let her comments just drift away. She said herself she doesn’t normally read your posts, which is so obvious, for if she had she wouldn’t have made her ridiculous comment in the first place. Now, I’m going to read the post that started all of this. Sorry for waffling on here! Your reply was quite civil but you stood your ground! Strange to think she alone has a private channel to God and Jesus as a true worker. Perhaps she is insecure in her beliefs. Puzzle references have often been used! I could not believe what I was reading! You of all people – plagiarism. One word: LOLLLLLLLLLLLLLLLLLLLLLLLLLLLLL. I particularly loved her bit about Jesus giving her a message not to share. Doesn’t sound like the Jesus I know about. This was my fav part: “But it really doesn’t matter What You think.. it just shows me how narrow you think GOD is in his abundance of sharing information via our consciousness in that you would think you are unique in this analogy of the puzzle of life.. Laughing now, but we are all human at the end of the day, and all have our lessons of ego to control… I learnt something too yesterday.. One that maybe I shouldn’t have made that reply so public..
Move on! This is not worth another ounce of your time and talent. You responded graciously. Now, let it go. Enough said! I like your reply Sue, fair enough! I believe s/he would never dare to write back. Enjoy your weekend! Many thanks Nahla… Having your support and comment means a lot to me.. Many thanks again. These days we have a so called christian democrate politician here in Norway. His movement stands for 3- 3,5% of the voters. Yet he feels in his right to topple the sitting government and alter the law in disfavour of the other 96,5 – 97% of the population. I expect the voters will thank him by viping his party totally out at the next election?! But christian he claims to be and a democrate as well. And, of course, he alone knows the truth! Blah!